Texas Online Radio: Today's Texas Quick Pick - Preston Coly - Hondo, Tx. Today's Texas Quick Pick - Preston Coly - Hondo, Tx. Today's Texas Quick Pick comes to us from Nashville via Hondo, Texas. Preston's music gets back to the traditions of Country Music... an artist that actually calls his genre "Country and Western". 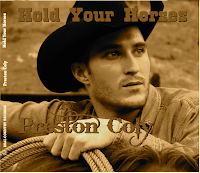 Great job on the music and the songwriting, take a few and introduce yourself to Preston Coly. Preston Coly’s earliest performances were as a 5 year old in the churches of Southeast Texas where he was born and raised. But the love of Country music and the gift of a guitar for his 16th birthday overshadowed any other thoughts of what he wanted to do for the rest of his life. Preston also had a passion for horses, which led to a stint on the high school rodeo circuit and ranching jobs as a horse trainer. While training horses and working other various jobs for several years, Preston also sang in every contest, dance hall, beer joint, ice house, honky-tonk, county fair, and rodeo in Texas. Encouraged by friend and mentor A.V. Middlestead, owner and producer of Sound Masters Studio in Houston, Preston felt he should consider taking his songs beyond the Texas music scene. A chance meeting with George Strait’s manager, Erv Woolsey, at the Houston Livestock Show and Rodeo seemed to be the sign Preston was looking for.